It was in a small town in northern Cambodia I heard tales of a small cluster of islands straddling the Thai and Malaysian coastlines. The young adventurer spoke of the islands in a low whispers fearing too many people would go in search of the tropical oasis and destroy what was so beautiful about them, their isolation and relative anonymous nature. I’d read The Beach, a book passed from hand to hand by backpackers, who subsequently dreamt of finding an undiscovered island with crystal clear waters, pearly white sand and nobody to share it with. As I listened to the young man talk of deserted beaches, ramshackle huts and thick forests, discovered only by locals and a handful of travellers, I wondered had he perhaps read the book too intently. I worked my way through Cambodia, Laos and across to Thailand where the throngs of travellers threatened to suffocate me. After weeks of island hopping in search of the solitude I’d found four years previous off the coast of Krabi, I realised the secret of Thailand’s beautiful beaches was out. It was the influx of American youths on their summer break, intent on spending each day of their trip inebriated that made me pick up a map and scour the southern coastline of Thailand. I traced the short distance from the coast across to what looked like a couple of specs on the map. These, I was convinced were the islands I’d been told about. It took me one minute to decide I was going to find them, four minutes to persuade a girl to come with me and forty-five minutes to pack our bags, say our goodbyes and head to beach to pick up a boat to the mainland. Of course, our timing was not perfect. The tide was out and it was another four hours until it came in and the boats could depart. We left the island in the dark, our new friends waving us goodbye and the excitement of not knowing where we were headed or what awaited us when we got there made me tingle from head to toe. It took two days to make it to our final destination. We arrived to one island and found deserted beaches, thick forests and a handful of travellers. But the sea was not crystal clear and the wooden cabins creaked and shook in the wind that battered the island. It was a Canadian guy we met on the beach that told us of a tropical island that sat a few miles off the coast of the island. A boat would leave the following day and he was going to be on it. This is how things go when you’re travelling. You move from one place to the next in search of your final destination, but finally you find the place that exceeds all your expectations. I do not know how long I spent on our island, four of us crammed into a one bed, dilapidated wooden shack. A hole in the corner served as the toilet, a ragged piece of cloth offering minimum privacy. We lived in bikinis and sarongs, lay in hammocks, walked through the forest and talked with the locals. It was not completely deserted, in fact there were two little villages, one of which had being spruced up offering travellers small concrete huts and pieces of corrugated iron were pulled together to create little beach bars. 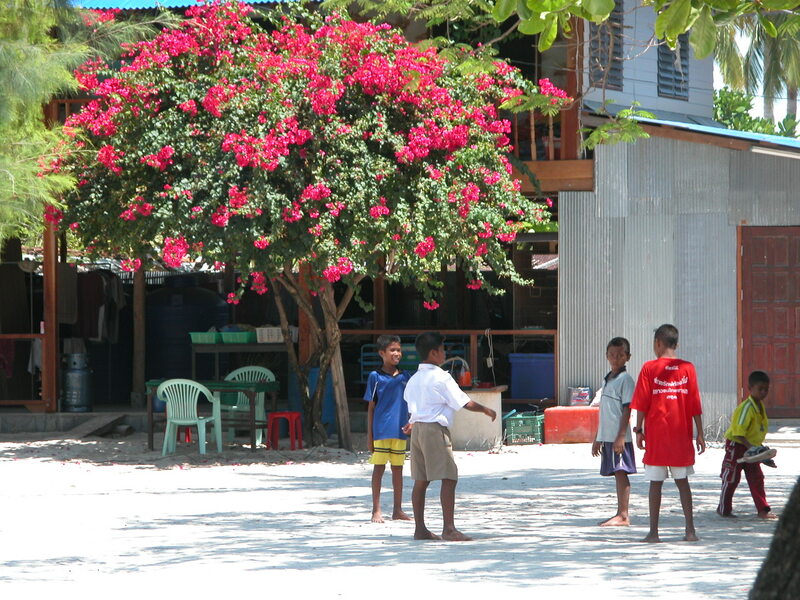 Yet, we chose to stay on the far side of the island away from the luxury of concrete, playing football with the children and enjoying the paradise we had discovered. Eight years on, I can only imagine my island has been discovered by the hoards of restless travellers. I will never return, as to do so may destroy my perfect memory. I was so content there I missed my flight to Indonesia. Time passed without us knowing. This is what an island break should be. The small, rugged island of Sardinia is a favourite summer escape for Italians, its coastline peppered with stunning beaches and crystal clear waters. No matter where you go on the island you’ll be able to enjoy the stunning scenery by boat, bicycle or even on foot. With Ryanair flying in to Alghero, a pretty walled city on the west coast, it has become a popular spot for those travelling from Ireland, especially families. Alghero has an atmospheric town centre, a maze of cobbled, narrow streets teeming with restaurants, shops and picturesque squares. Dotted throughout the town are seven towers, its edges fringed by the old imposing town wall. Not only is Alghero a popular tourist destination, but it is also a functioning fishing port and so the restaurants tend to serve up freshly caught fish of the day, cooked in simple, but mouth-watering sauces. It’s a laid back town, with some good beaches and is located close to some excellent vineyards, which makes for a good daytrip, while the Grotta di Nettuno is another popular daytrip for those in the mood for a scenic boat ride. There are a number of good beaches outside Alghero itself, which can be accessed by local buses, however some of the islands true gems lie on the eastern coast. Cala Gonone is a small town, tucked away on the coast, approached by a treachorous, winding road with dramatic views out across the Orosei Gulf. Its secluded location has kept it relatively unspoilt, although there is a good selection of hotels and B&Bs. It is a popular spot for families, with a long stretch of sandy beach to the south of the town ideal for the little ones to spend hours building sand castles and dipping in to the refreshing sea. The northern and eastern coast of Sardinia has some of the most beautiful beaches and has endless opportunities for those seeking water activities. Sailing is very popular, with people renting boats and spending a week sailing around the Maddalena Islands, located off the coast. Palau is the jumping off point for the islands and the nearby Porto Pollo is also famous for windsurfing, kitesurfing and sailing. The Costa del Sud is a relatively undiscovered part of Sardinia, a 20km stretch of road in the south, known as one of Sardinia’s most scenic drives, backed by olive groves and eucolyptus trees, overlooking the cragged coastline and turquoise waters below. The towns and villages in the Southwest are unspoilt by tourism and the islands San Pietro and Sant’Antioco have excellent restaurants and nice beaches. Just Sardinia From €1040 for a three bedroom villa (sleeps up to 8 people) – Cala di Falco Villas on the 9th and 16th June that would be fantastic. This is 50% off the original rate. Lastminute.com Special offer – From €1161 per person includes 6 night stay in 4 star Hotel Califfo including indirect return flights to Cagliari. Ibiza initially became popular for its pristine beaches, turquoise waters and relaxed vibe. However, the years have not been kind to certain parts of the island, with nightclubs and highrises distracting from the true beauty of the island. Formentera is a small island that sits off the east coast of Ibiza and boasts stunning beaches, traditional towns and guaranteed peace and quiet. The beauty of Formentera is that it has been untouched by tourism and is only a short 2-mile boat ferry from Ibiza town. As you pull in to the port, La Savina you pass a spangly, white sandbar jutting out into the sparkling emerald sea that surrounds the island. This is the first you’ll see of the idylic beaches that fringe the small island’s coast. There are several towns, all quite traditional and undeveloped, Sant Francesc Xavier, Sant Ferran de ses Roques, El Pilar de la Mola with markets taking place at the weekends. The most popular places to stay are along the remote Playa de Migjorn, a stretch of beach, dotted with several hotel resorts, including the trendy Gecko Beach Club (http://www.geckobeachclub.com/#/home-es). Alternatively, the small, but lively village Es Pujols has a beautiful beach, great restaurants and some good hotels. A lot of the accommodation on the island is rustic, but charming, however there are several 4 star hotels. It is worth hiring a moped for a couple of days, to speed around the island and explore the pretty villages, visit local markets and secluded beaches. Ile-de-re is a small island on the west coast of France, extremely popular with families. Only a 30-minute drive from La Rochelle, the island can be reached by a bridge. As the island is flat and criss-crossed by cycle tracks, cycling is the best way to get around. You’re never far from a white, sandy beach and some are without facilities so it’s best to take a packed lunch and refreshments with you.